Support solution for your palletizing line. EXCALIBUR - Automatic tie sheet cutting machine for tie-sheets to be integrated into palletizing lines. Thanks to EXCALIBUR® you can produce your palletizing sheets on your own premises. 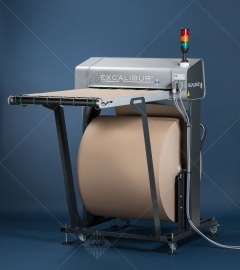 EXCALIBUR® is the ideal tool to reduce direct and indirect palletizing consumable costs. Make savings on consumable costs. Improve packing line operating costs by avoiding unplanned shutdowns. Supply a single roll reference to produce up to 15 different sheet lengths. The operator loads the roll onto the machine's frame using a forklift truck or pallet loader. They load the paper into the cutting head and program the required cutting length on the MMI. EXCALIBUR then cuts a sheet each time the absence of a tie-sheet is detected on the conveyor table. EXCALIBUR runs as a stand-alone machine. CLASSIC model. Tried and tested effectiveness. The operator loads the roll onto a dedicated roll-holder trolley using a forklift truck or pallet loader. The trolley is installed at the base of the cutting machine. The paper is loaded into the cutting head. The cutting length is programmed on the HMI of EXCALIBUR to cut the sheets in stand-alone mode or the line manages EXCALIBUR and orders it to produce the reference. EXTENDED model. Working for robotic lines. The EXTENDED model is delivered with a conveyor whose length is adapted specifically to the needs of your project. Installed over the robotic lines' protection barriers, EXCALIBUR supplies the cut sheet to the robot. The operator may load the roll onto EXCALIBUR while remaining outside the robot line, so preventing the line from being shut down for changeovers. UNO VERSION: a single sheet is positioned on the conveyor at a time. DUO VERSION: to palletize half-pallets, 2 sheets are positioned on the conveyor at a time. QUATTRO VERSION: to palletize quarter pallets, 4 sheets are positioned on the conveyor at a time. By cutting tie-sheets directly on your production lines and by presenting a single sheet at a time to the palletizing line gripper, you can take advantage of numerous opportunities to reduce direct and indirect tie-sheets costs. During the operational phase, the EXCALIBUR tie-sheet cutting machine enables you to save time and reduce the number changeovers, allowing you to produce made-to-measure sheets from a single roll and guarantees the smooth operation of the tie-sheet gripper. Using this technology enables you to reduce production time and increases flexibility and productivity. By reducing paper weight. The thickness of the paper tie-sheet can be adjusted in order to strictly meet the requirements of the pallet. By using consumables of different qualities. By producing exactly the length required. Robot grippers and palletizers frequently have trouble taking the sheets one by one. During palletizing, a sheet may be dropped and cause the line to be shut down. Conversely, the gripper may take several sheets a time, generating sheet over-consumption and causing the line to be shut down if sheets are dropped. No difficult pick-up of the tie-sheets. No risk of the robot losing the tie-sheet. No risk of grabbins several tie-sheets at a time. Simplified pick-up cycle: the tie-sheet is always positioned at the same height. A roll of lightweight paper contains up to 10 times more tie-sheets that a pallet of corrugated cardboard tie-sheets. Reduced storage volumes. Fewer operator interventions required to load consumables. Consumable changed by a single operator on EXCALIBUR. Depending on the type of installation, the operator no longer has to enter the palletizing enclosure to change the consumable. Reduce the number of references... a variety of different lengths of slipsheets can be produced from a single roll: For example, on INPUT, a 1200 mm roll enables both 1200 x 800 mm (EURO) and 1200 x 1000 mm (CHEP / UK) sheets to be produced on output. EXCALIBUR is a tool that cuts several qualities of consumable. It only takes half a day to set up the EXCALIBUR on your packing line. 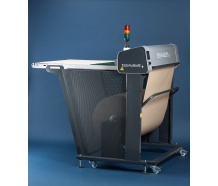 EXCALIBUR® a Plug & Play solution to cut your sheets! You receive your paper in rolls on pallets. Load the roll: only 1 operation is needed, without special equipment. Choose your pre-registered reference. Up to 15 programmable dimensions! It's ready and you can cut your sheets! Only 1 operator is needed to put the EXCALIBUR® into service. Consumable loading and programming time: less than 2 minutes. To save time, choose a model with roll loading carriage. Stand-alone mode: the line operator selects a dimension. EXCALIBUR® produces the sheets continuously. As soon as the sheet is cut and positioned on the conveyor, the palletizing line's automated gripper can pick it up. EXCALIBUR then detects that no sheets are present, and produces a new one. Interface in communicating mode: for PLC control of your packaging line. When the sheet is positioned on the conveyor, it is picked up by the palletizing line's automated gripper. EXCALIBUR will wait for a new signal from the robot to reproduce one of the 15 programmable references. Our engineering office manages the design (project studies, overall plans, mechanical studies, detail plans, etc. ), production, assembly, installation, training for production and maintenance teams. Contact CGP EXPERT for an advance study to assess the technical feasibility of your integration project. And yet, EXCALIBUR is a modular machine. If the configuration of your line requires any dimensional adaptation, (for example including the modification of the roll management, the sheet passage or operator access to the cutting machine), contact CGP EXPERT's DESIGN AND ENGINEERING OFFICE to design your made-to-measure solution. Do you have a palletizing line that no longer meets your needs? You now need to produce half-pallets or 1000 x 1200 mm sheets? Do you have a tie-sheet pick-up effectiveness problem? Are you looking for an economical and scalable solution that traditional tie-sheet stores aren't providing you? Thanks to its compact size and modularity, we can retrofit your line by installing EXCALIBUR. The success of an automation project depends as much on the design and implementation of the palletizing station as on the choice of peri-robotic equipment. The advance project: to define the requirements and assess the profitability of the project. The project: production of the EXCALIBUR cutting machine and, in partnership with the palletizing line's manufacturer or integrator (engineering company, design office, consultant), installation and commissioning. Training: to ensure quick start-up of the EXCALIBUR cutting machine by production and maintenance personnel. Lower consumable costs: EXCALIBUR enables the use of very light, and therefore economical, paper consumables. Lower labor costs: EXCALIBUR removes operator interventions for loading traditional pre-cut tie-sheet stores by hand. 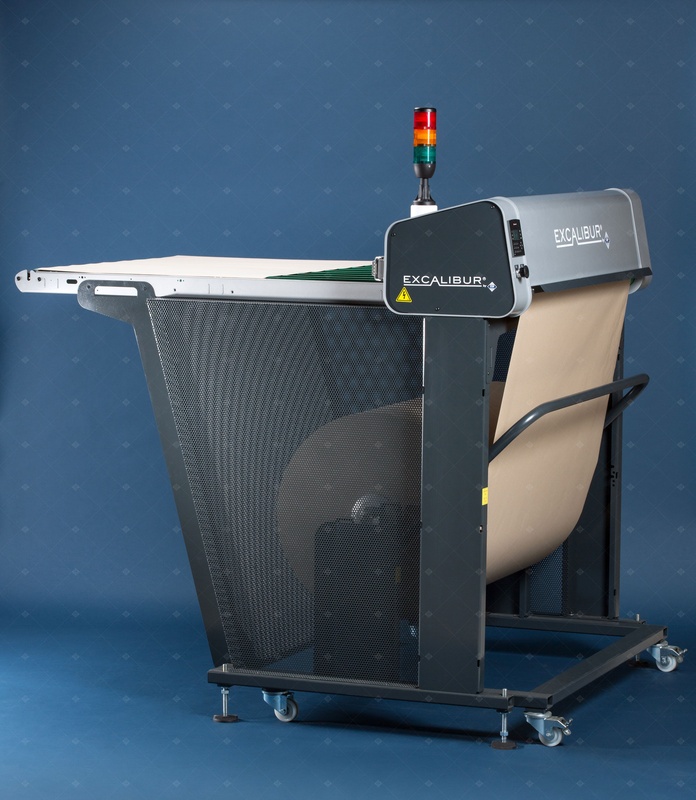 Production management flexibility: Operating in stand-alone mode or managed by the line, EXCALIBUR produces up to 15 different sheet references from a single reel. The DUO and QUATTRO versions enable 2 pallet semi-sheets or 4 pallet quarter-sheets to be produced. Stock reduction: A roll of lightweight paper contains up to 10 times more tie-sheets than a pallet of corrugated cardboard tie-sheets. The average period for return on investment for an EXCALIBUR machine is less than 18 months. ERGONOMY: The operator no longer needs to load traditional pre-cut tie-sheet stores by hand. Improvement in working and safety conditions: depending on the type of installation, the operator no longer needs to enter the robot line for changeovers. No forklift trucks are needed to load the roll onto EXCALIBUR.